The CONSCIENCE project is reaching it's end. The meeting in Eastbourne made a big step towards finalising the project, with presentations and discussion of deliverables, presentation of the guidelines set-up and the integration of that into the CONSCIENCE website. The CONSCIENCE project – Concepts and Science for coastal erosion management has reached an another important milestone in its lifetime. At the occasion of its 3rd annual workshop the project team has joined together in Cork (Ireland) to share and report the latest developments and research findings. 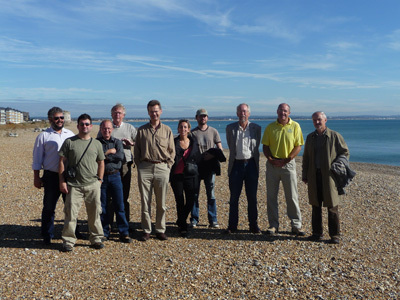 They actively participated in a field trip to the Kerry Coast, in particular to the recently affected by storm sand spit at Rossbeigh and the Inch beach, the Irish study site of the project. The Rossbeigh sand spit, has now a breach that has widened up to 500 m from December when the two-mile spit first split at its tip and a new island created. The CONSCIENCE group of experts have visited the area, learned about the situation, discussed it and advised the Kerry Council engineer Éamon Scanlon. In conclusion what is happening in this sand spit is a natural process and if measures are to be taken the options of sand beach nourishment and preservation of the sand dune belt should be considered above all other structural defences. The 9th International LITTORAL conference took place in the Italian city of Venice, late November 2008. This successful event has been professionally organized by CORILA team and joined more than 260 participants, ranging from science, policy makers and the European Commission representatives of three Directorates: Maritime Affairs, Environment and Research. Topics such as EU Policies and ICZM implementation in Europe, global changes in the coastal zone and other specific aspects related to coastal and water processes, impacts and management were approached and debated. At this occasion several workshops have been held as well as presentations of key EU projects and initiatives among which CONSCIENCE have been presented by Marcel Marchand (Deltares, NL) the project leader. View the CONSCIENCE presentation! A mid-term review took place on 8 and 9 October, 2008 at UPC in Barcelona. The reviewers, Prof. Peter R. Burbridge and Dr. Robin McInnes from the UK and Prof. Biliana Cicin Sain from the USA commended the project team on the achievements of the project to date and regarded its products of high quality. They also made a number of observations and recommendations that would lead to enhanced results and uptake of the outcome of the project. These recommendations were used to prepare a roadmap towards a successful ending of the project. This roadmap is now used as guidance for the project’s final year.